On her fourth album, Holter may have crafted her most peaceful -- and poppy(!) -- album yet. Upon the release of her 2011 album Tragedy, Julia Holter received praise as one of the most innovative avant-garde electronic artists out there. While she clearly deserved the praise she received, the categorization was inaccurate. She recorded Tragedy with primarily electronic instrumentation, but she only did so out of necessity -- as a fledgling artist, she lacked the funds to hire the session musicians that would characterize much of her later work. Her next album, 2012’s Ekstasis, added luscious string arrangements and free-jazz horn lines, only retaining occasional electronic elements like the processed vocals of the two “Goddess Eyes” numbers and the synth drum patterns of “In the Same Room”. With her 2013 masterpiece Loud City Song, Holter shed overt electronic affectations in favor of elements of classical composition and 20th-century art music, and lyrics that scan more as modernist prose than pop lyrics, staking her claim as perhaps the most boldly original artist of the modern day. And now, with 2015’s Have You in My Wilderness, she’s thrown another unexpected element into the mix -- pop song structure. “Feel You”, the first single as well as the first track of the album, provides a perfect introduction to the album’s tone. A brief rising harpsichord line, and then suddenly, her voice, two notes, wordless, like a whistle. Strings swell, a stuttering drum line, and then... pop perfection. The album’s second single, the gorgeous “Sea Calls Me Home”, brings back the harpsichord to underscore probably the greatest chorus Holter has written. However, Holter resists the idea that the album was deliberately written accessibly, saying in an interview that “I’ not strategizing some pop breakthrough because I’m not the right person to have some pop breakthrough.” Indeed, the album possesses its fair share of avant-garde moments -- “Silhouette” ends in a claustrophobic string build reminiscent of the Beatles “A Day in the Life” or St. Vincent’s Actor and the break of “Sea Calls Me Home” surprises with an explosion of Ornette Coleman sax lines. Another theme that recurs is that of the wilderness. Holter’s addressed the wilderness before, notably in 2013’s standout “In the Green Wild”. Holter looks at the wild as place of freedom, without boundary. A recurring symbol of the wilderness is that of the ocean, as in “Sea Calls Me Home” or on the title track’s beautiful metaphor “Oh, in your waters I've dropped anchor”. Another wilderness pops up, too, a far cry from the claustrophobic French city of Loud City Song -- the American west. In a concert a few nights ago, Holter introduced “Everytime Boots” as a song about cowboys and indeed, she speaks of cattle and rattlesnake winds. The majority of her songs -- and indeed, her entire musical aesthetic -- conjure up sensations of the past. Only here, she constructs a significantly more American landscape than any of her other works, with their decidedly European slants. In the jazzy “Vasquez”, she continues, saying that “no one knows the story in the gold country”. An L.A. native, Holter constructs an 1800s perspective on the land that would one day hide her eventual home. For nothing lasts long in the wilderness, free of all boundaries. Mankind must construct them, she suggests, and eventually that leads to cities and yes, the inevitable urge to return to the wilderness. 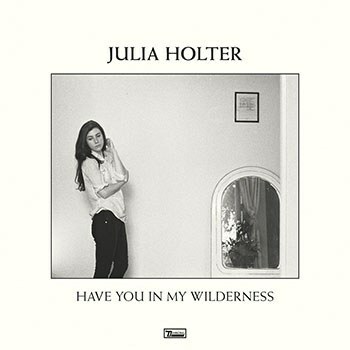 And once we get there, we find what a pleasure it is for Julia Holter to have us in her wilderness.